COSTA MESA, CA--(Marketwire - February 17, 2010) - T3 Motion, Inc. (OTCBB: TMMM) (www.t3motion.com), a leader in cost-effective, clean-technology vehicles, has deployed over 75 T3 Series electric standup vehicle (ESV) in Mexico. These innovative, all-electric vehicles are hard at work in several different types of applications across that country. Public safety is one of the most prevalent applications for the T3 Series. 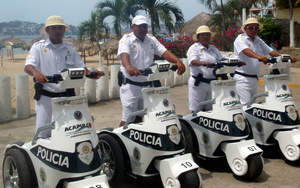 In Mexico, the vehicles are being utilized by the police departments in Acapulco, San Nicholas and Durango. The T3 Series provides several advantages for law enforcement patrols including a commanding presence, agility, fast response, high visibility over a wide area for the driver, and enhancements to community relations. With tourism an integral aspect of the Mexican economy, the safety of visitors is a high priority. The T3 Series is contributing to that effort for the Nuevo Laredo tourism police department. The vehicles offer an important sense of security for the area's tourists as they enjoy their visit. In addition, the T3 Series has been selected for security patrols at the Volkswagen manufacturing plant in Puebla. Private security is another highly popular application for the vehicle worldwide. Other deployments in Mexico for the T3 Series include the Mexican secret police and special events such as the country's annual Independence Day parade. "International deployments are a major growth area for T3 Motion," said Ki Nam, CEO of T3 Motion, Inc. "We are very pleased to be assisting agencies and companies in Mexico in achieving their public and private security goals." T3 Motion, Inc. (OTCBB: TMMM) specializes in cost-effective, clean-technology vehicle solutions for professional markets including law enforcement, security, retail, government and the military. The company is dedicated to raising the bar on vehicle environmental standards and green energy solutions. In 2006, T3 Motion revolutionized the world of personal mobility with the introduction of its flagship T3 Series electric standup (ESV) vehicle. The foundation of T3 Motion vehicles is the company's proprietary power management technology that maximizes range and minimizes recharging time. T3 Motion is headquartered in Costa Mesa, California. For information, email sales@t3motion.com, call 714-619-3600 or visit www.t3motion.com.